There really is no single, best coffee roaster machine. You must carefully consider your own needs and budget and then simply compare and contrast the products available to you. 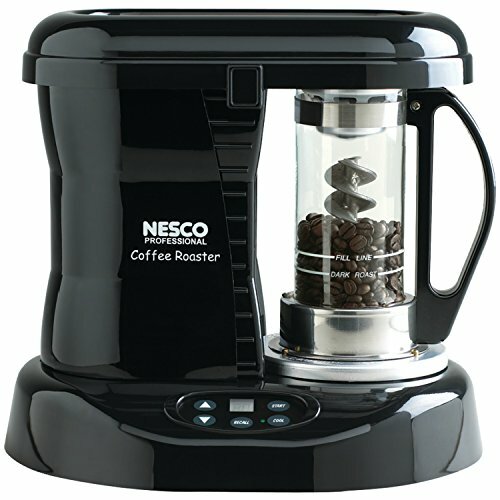 For us, the best home coffee roaster would have to be the Nesco Coffee Bean Roaster! ﻿Should You Buy A ﻿Coffee Roaster? Is Home Coffee Roasting Worth The Trouble? There are a number of different ways to roast coffee all with a unique flavor. In this guide we will focus on what we think you should consider when choosing a home coffee bean roaster. 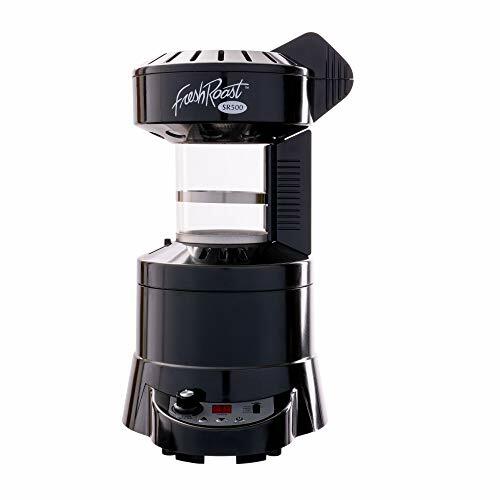 The FreshRoast SR500 is an automatic air roaster and has the ability to roast any kind of coffee, including espresso. 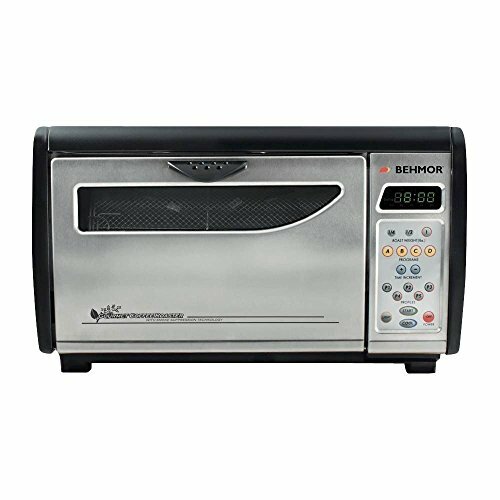 This product can create a variety of roasts simply by regulating the temperature, controlling the fan, or changing the roast time. It might be a good choice for someone who would like to roast their coffee by adjusting the temperature without interrupting the roast cycle. Another good feature is that the chafe collection is efficient, which allows for the majority of the chafe to be cleaned out of the unit. Roasts any kind of coffee, including espresso. Adjust temperature without interrupting roast cycle. You can adjust the time in small increments. Does not move the beans well at the beginning. Beans near edge of chamber need to be stirred manually until they begin to roast. Default timer is 6 minutes, which is not enough for a darker roast. On the other hand, this roaster does not move the beans well at the beginning of the cycle and the beans may need to be stirred manually until they begin to roast. The default timer lasts for six minutes, which is not enough time if you like a darker roast. Additionally, the cooling cycle takes a bit of time so you might need to start cooling before the beans are completely done. If you enjoy watching your beans roast, the Behmor 1600 drum coffee roaster might be for you. There are interior lights within the unit that allow you to view the roasting process. Another benefit is there is no visible smoke so the unit that is about the size of a small toaster oven can be used indoors. Not to mention, the roaster can roast up to one pound of beans, which is the greatest capability among home roasters that is available at this time. Roasts up to one pound. Interior lights up so you can view the roast process. Variable speed roasting drum with five customizable roast profile settings. Not meant for roasting darker beans. Will not allow you to add more time once you start roasting. The machine has three buttons for weight, four for programs, two for time increments and five for power profiles. Additionally, the removable chaff and tray makes for easy clean up. Unfortunately, this roaster is not meant for roasting Vienna, French, Italian or darker beans. Also, there is a mandatory two minute cool down period so if you do not reach the second crack during your roast and the cool down starts, you will have to start over. One problem with roasting beans in a frying pan is that beans spill out over the side of the pan. In comes Nuvo Eco Ceramic Handy Coffee Bean Roaster to solve this problem with its simple, but efficient design. After placing the beans in this ceramic roaster, you move the beans around and they will stay inside due to the shape and small hole on top. Easily portable because of smaller size. Use at home or while camping. Short handle might make hands hot. Must manually move the roaster during roast process. If you are looking to start a hobby roasting beans, then this roaster might be a good way to start since it is not a huge investment. 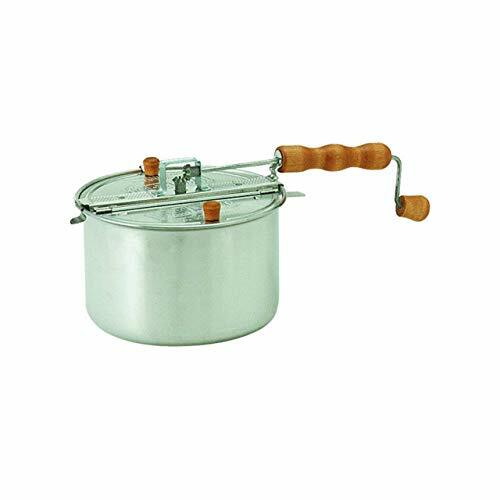 The smaller size of this roaster makes it great for camping or using at home on top of the stove. On the down side, the handle might still get hot even with the cowhide leather handle. Also, since the handle is on the shorter side, it might be challenging for someone with larger hands to grip. You might consider wearing leather work gloves or some other type of heat resistant glove to keep your hands from getting burned. 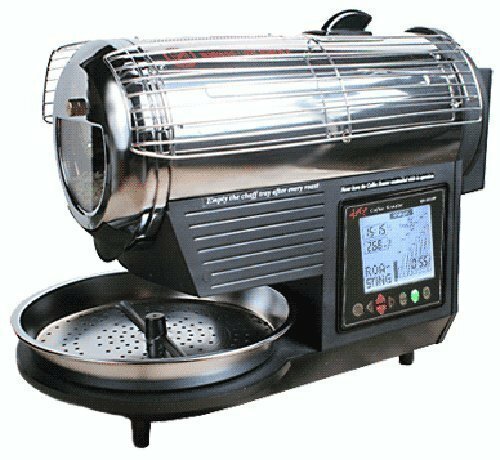 This roaster might work well for someone who does not need to roast a lot of beans at once since the roasting capacity is 30-70 grams at a time. 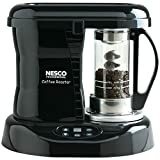 We think the Nesco CR-1010-PRR Coffee Bean Roaster is best home coffee roaster! The attractive design and easy operation allows the user to roast up to 1/3 pound of coffee beans in 20-30 minutes time. There is a patented catalytic technology that reduces odors and smoke during the roasting process, perfect for our kitchen! Okay, okay. Have a look at the following video review to see why we're excited about this machine. Quiet and simple to use. Roast up to 1/3 lb. coffee beans in 20-30 minutes. You can only adjust the amount of time, not the temperature. Difficult to get replacement parts. Another good feature is that this roaster will create an even roast and uniform color, which is helpful for someone who wants to make their own coffee blends. Also, the chaff is caught in a cup so the unit can be kept clean. This roaster does not have the ability for the user to adjust the temperature and be creative with roast profiles. The machine is attractive, but also has many parts. If one of the parts fail, it may be difficult to find replacement parts. Should You Buy A Coffee Roaster? It is possible to roast coffee beans at home using a skillet, your oven, a popcorn popper or your grill. This kind of roasting can be slow going, and your results may be fairly unpredictable - especially at first. This is why so many people are opting for dedicated bean roasting devices. Roasting green coffee beans at home has become a popular pursuit recently, and there are many good reasons for this. Green coffee beans are less expensive than roasted beans, and they can be stored for longer periods of time. Home roasted coffee is much fresher than pre-roasted, and the lower prices open up a world of selection in beans. Roasting coffee is a bit of an art. With good roasting skills and a good bean supplier, you can customize your blends and your roasts for a one-of-a-kind coffee experience. Do you like your coffee light or dark? Do you drink a great deal of coffee? You must also think about how much coffee you want to roast at one time. Typical roasters can process between four and twelve ounces of beans. This will give you between four and seven cups of coffee (respectively) if you consider a coffee cup to be six ounces. You must also think about how often you want to roast coffee. It's a good idea to get a roaster that can produce a three-day supply. That way you can manage your roasting time and still enjoy very fresh coffee every day. Having good equipment is very helpful, but being able to judge the success of your process also involves being able to use your senses to recognize the colors, scents, sounds and flavors that are the signposts of a successful roasting process. What features you choose is all a matter of preference. If your main objective is to roast coffee beans, the truth is you can do that with a cast iron skillet over a campfire. Complexity and bells and whistles are not necessary; however, the fact that you can choose a roaster that has features that will make it easy to fit coffee roasting into your life is a plus. An air roaster tends to produce a very "bright" flavored coffee. If you prefer a more full-bodied coffee, you might like a drum roaster better; however, batch size is another consideration. Air roasters are usually made for smaller batches, and drum roasters are made for larger batches. Air roasters work quickly and usually complete roasting in about twelve minutes. This produces a lighter, brighter flavor. Air roasters are typically intended to handle small batches of beans. Drum roasters work differently than air roasters. They have a drum that rotates and keeps the beans moving as they roast. They are slower roasting and generally take between fifteen and twenty minutes to complete the process. A drum roaster can usually handle a larger amount of coffee than an air roaster, so if you like to drink a lot of coffee with a full, rich flavor this may be the best choice for you. Some of the better drum roasters such as HotTop give you a lot of programming options and a great deal of control over temperature and roast time. However, until you have had some experience with roasting you may have a hard time knowing how to program the more complex machines. Roasting coffee beans is a smoky business. The bigger the batch and the darker the roast, the more smoke it will produce. That's why roasting outside can be a very good idea. You can also set your roaster on your stove top and be sure to keep the hood fan on. Alternately, you might set up near a window and use a fan to vent the smoke out. 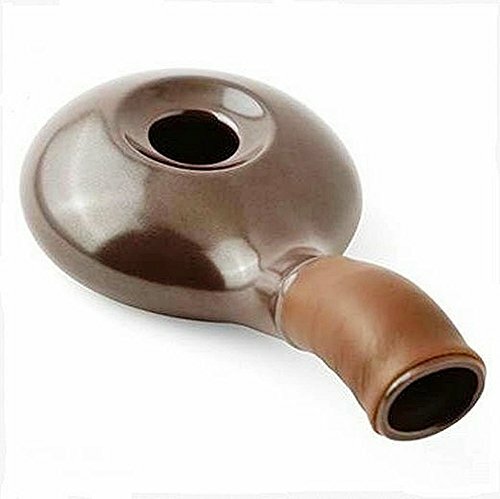 There are some roasters that can be equipped with a vent hose to vent the smoke to the outdoors. Any time you are dealing with heat and fire, it's dangerous. If you practice common sense safety precautions, you should be able to roast your coffee beans without burning down your house or hurting yourself. Read and follow all safety instructions that come with your machine. Use proper safety gear when handling hot surfaces. Always roast in a well-ventilated area. Roasting coffee isn't like doing a load of wash. You can't start the process and then head out for errands or work. You have to stay and attend to the roaster from start to finish. Otherwise, accidents are likely to happen. If you would enjoy it as an art and a hobby, it's worth the effort. If you are a fan of convenience, it probably is not. For these reasons you are probably wisest to start out with a simpler, less expensive machine with fewer choices at first. Look for a machine that doesn't provide too many ways to mess up! This is why an old popcorn popper can make a very nice home coffee bean roaster for a beginner. It can roast small amounts of beans, and you can watch and familiarize yourself with the process.